Within the Palace, the companions of Rama, elated and happy, ready with their bright countenances and splendid robes were waiting to accompany him to the Festival Hall. Sumanthra went into the apartments that lay still deeper Inside the Palace. There he saw Rama, seated on a golden cot, scattering Divine Light around him, and Sita standing by his side, gently fanning him. He shone like the Moon with the star, Chitra. Sumanthra was in a hurry; he could not brook delay. He said, "Rama! Mother Kaikeyi and your Father have both asked me to bring you quickly to the Palace of that Queen; they have sent me on that mission here; I have hurried hither for that same purpose". As soon as he heard those words, Rama turned towards Sita and said, "Sita! This is a sign of some obstacle, and not of anything else. I am not unaware of this; but I kept silent and said, 'Yes' for everything, so that Father might be kept happy. Fatherís orders are to be honoured, lest he be pained." While Rama was talking in this strain, the heart of Sumanthra was pounding fast inside him. He was trying to interpret Ramaís words and the picture of Dasaratha lying wailing on the floor. He was now convinced that the obstacle Rama spoke of was genuine. But, Sita interrupted Rama; she said "Lord! What are you talking about? On this auspicious occasion you should not speak thus. Whatever the obstacle, father-in-law's words must be honoured. If he is content, we are content. For his sake, we must renounce whatever has to be. Do not hesitate even a little; go immediately. Whether the Coronation takes place or not, we shall be equally happy. Mother Kaikeyi has inordinate affection towards you; any- thing that she directs us to do, any order that she gives us, will be for our good beyond doubt. There is no one here on earth who is as solicitous for our welfare as Mother Kaikeyi. When Father and such a Mother send word that you should hasten towards them, how happy we should be!" Saying this, Sita followed Rama to the main door of the Hall and wished him well. Rama told her, "Sita! Donít I know all this? For me, the days that are past, the days that are around us and the days yet to come are all the same. I welcome each day with full joy. To uphold the reputation of Father, I am prepared to do anything, I am prepared to go anywhere. I am indeed immensely happy that you share my feeling and second my resolve." Rama moved out, accompanied by Sumanthra. When they ascended the chariot waiting on the road in front of the Palace, people raised shouts of 'Jai, Jai Ramachandra Prabhu ki Jai.' The acclamation shook the skies. Sumanthra announced to the populace, "Now the chariot is not taking Rama to the Coronation Hall. It is taking him to where the Emperor is. So, allow the chariot to go as fast as it should. Rama will return in a few moments; so wait here itself." Sumanthra explained the reason for the hurry, and drove in hot haste. When Rama was proceeding thus along the city streets to the Palace of Kaikeyi, in his divine chariot, as soon as he was sighted, heroes cheered like lions. Minstrels and courtiers started paeans of praise. The strains of many instruments of music filled the sky. Acclamation of "Jai", "Jai" rose from the thick masses of people on both sides of the road. Women in their best clothes, bedecked with jewels, thronged the terraces of the house and filled the windows, eager to wave lamps when Rama passed by. When he approached the Palace, they showered floral petals and waved sacred lamps. People gazed upon the Prince until he passed beyond reach of the eye; then, they relished with joy the picture of "Rama in the chariot" they had imprinted on their hearts, and, stood without stirring wherever they were, like idols of themselves, lost in contemplation of the Bliss that filled them. The chariot rode into the precincts of the Palace of Dasaratha named Vardhamana, as imposing as Mount Kailas itself. It passed through the three quadrangles guarded by vigilant bowmen. Then, Rama alighted from the vehicle. Thereafter, he moved through two more quadrangles on foot. While walking across, he told his companions and even Lakshmana to stay back. For, Rama knew what was about to happen soon. In spite of this, he was acting like a mortal, as naturally as any would under the circumstances! Finally, Rama entered the apartments of the Queens and the place where Dasaratha had fallen on the bed. His hair was disheveled; he was wearing the clothes of 'yesterday'. He was lying on the bed without any regard to propriety. Rama was astonished at the spectacle. Kaikeyi was standing by the side of the bed. Dasaratha's face had lost all trace of brightness; he was lamenting and wailing. He raised his head; his eyes fell upon Rama. His tongue failed to spell out what he longed to say. Tears streamed from his eyes. Though he tried to speak, no sound came. Rama had never before seen or experienced such a fearsome scene. He was filled with anxiety; he hastened to the presence of his father, and held both his feet in his hands. "Tell me, father, why you lament so? What is the cause? I shall try to confer joy on you, in the best manner possible. I shall dedicate my very life for the sake of restoring your Ananda. Tell me what has caused this grief; do not weep", he pleaded. At this Dasaratha exclaimed, 'Rama!" and broke into tears again, unable to continue. He lost consciousness. Rama tried to revive him and console him; but, he fell deeper into grief and could not be pacified. Then, Rama mustered courage and took his father to task, "Father! what is all this? You have to instill courage into young persons like me; on the other hand, you are weeping and wailing and filling us with fear! No. This is not right. 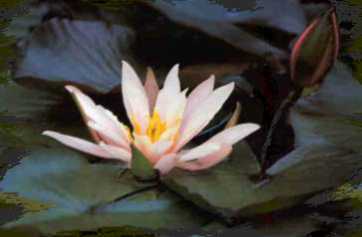 This is the occasion to be happy; but, is it Dharma, is it proper, for you to sink into grief? Till this day, whenever you were angry or worried, my coming to you used to remove in a trice all signs of those troubles, and to make you beam with Ananda. You used to gain peace again when you drew me near, didnít you? How is it then that the longer you took at me the more you suffer from sorrow? This makes my grief too more painful. Can you not mention the reason for this strange behaviour and bring solace to me? Wonít you tell me? Has any wrong been committed by me? Or, if there is anything I have to do, tell me, I shall do it without fail. I shall correct myself, if you tell me my faults. Do not grieve; do not doubt or hesitate; tell me with the authority of affection what I have to do, and I shall bow to the order. Father! Your being plunged in grief is not good augury for you, for me as well as for the Empire". Praying thus, Rama turned towards Kaikeyi. With folded palms, he asked her, "Mother! Have I committed any wrong? Tell me who that execrable sinner is who caused such grief to father! The moment father saw me, he used to beckon me lovingly, draw me close to him, and fondle me caressingly! Now, he does not even look at my face; why is it so? He does not utter one word; he keeps his face turned away from me! If, however, the fault, the crime is mine, I am ready to suffer any punishment to atone for it. It is enough for me if father is happy. Or, is he suffering from any illness or disease? Else, have my brothers, Bharatha and Satrughna sent any bad news? They are well, arenít they? Mother Kausalya and Sumitra are well, I hope! I am overcome with grief, since I am unable to understand the reason for fatherís agony! I shall do whatever is needed to bring joy back to him, however hard it may be. His command, however painful, I shall discharge to the full, most loyally, with bowed head. Whoever is born, the father is the cause of his birth. Therefore, the father is everyoneís visible God. I seek nothing higher than his happiness. Have compassion on me; tell me what has taken place. Mother! was your self-respect hurt by any incident, resulting in your speaking some harsh words against father? Or, did my mother act against his will and hurt his feelings? Mother Kausalya will never behave like that. And, Sumitra? I am more certain about her. She will not at all act so. And father will certainly not lament so distressingly, even if either of them acted so foolishly. There must be some very serious reason for his plight. When father is reluctant to tell me what that is, at least you can tell me about it and console my grief". Looking at Rama who was so pathetically praying to her, Kaikeyi gave up all sense of mercy and moderation, all consideration for the husband who might be plunged in deeper misery when he hears her words spoken in utter disregard of the calamities they were sure to usher in. She did not stop to inquire whether the words could be uttered or whether they were better left unspoken. She did not discriminate between the fleeting present and the oncoming future. She brushed aside the claims of love, and cast off her own innate dignity and motherly status. She said, "Rama! Listen! Years ago, during the battle between the Devas and the Asuras (Gods and Demons), your father was wounded by dire demonic arrows and he suffered unbearable pain. I nursed him back to health and happiness. He appreciated my sacrifice and service and told me to name two boons promising to grant them to me. At that time, I felt that the only thing I craved for was his recovery and victory; so I replied: ëI do not desire any boon now; I shall ask you for the promised boons when I feel the urge laterí. Your father said, 'Right! whenever you like, ask me whichever two boons you wish for; I shall certainly grant them and fulfill your desire. These boons have no limit of time and are bound by no condition. Whenever you ask, whatever the boons, I shall give them', he vowed. "You know that scions of the Ikshvaku line never break their promised word. Putting faith in that well known fact, I asked now for those two boons: one, that my son Bharatha should be crowned Emperor and two, that you should be sent into the Dandaka Forest for a period of fourteen years. As a result, your father is creating this hubbub! Why elaborate further? I shall not modify or withdraw my demands. If your father is as adherent of Truth, and if you desire to prove that you too are an adherent of Truth, you have to go this very moment to the Dandaka Forest, wearing deerskin and matted hair. You have to reside there for fourteen years. "Since you are his very life-breath, he does not like to send you into exile; he is reluctant to ask you to go. He apprehends you may take it amiss; that is the reason for this grief. Rama! No other calamity or deluge has happened here. It is meaningless to exaggerate this minor matter and make out that a mountainous catastrophe has landed on us. Rama! The father can be saved from the sin of breaking his word only when his very image, the son, resolves to fulfill the vow he fails to fulfill. Else, if he who vowed and he who is the son of the person who vowed, both neglect it, then the father has to meet the doom of eternal downfall. You are not unaware of this". Rama was not affected in the least, while listening to these words uttered with such deliberate hard-heartedness. With a smile playing on his lips, he replied, "For this reason, it is not proper that father should lament". He nodded his head as if to signify his approval of the proposals made by Kaikeyi. But, when this conversation fell on his ears, Dasaratha felt as if his heart was being sawn within. He rolled and groaned in extreme agony. Rama turned towards Kaikeyi and said, "Mother! It will happen as you have contemplated! I am reverentially placing on my head the promise made by my father. It is enough if father draws me near him as he so lovingly used to do until now and speaks to me affectionately, and blesses me. Well, if I am at least told that I donít deserve these, that I have not earned that merit, I will accept it without demur and with equal joy and satisfaction. For, father always wishes the best for me. He blesses me always and desires that I progress ever. He is a great seer; he is for me not only the father, but the preceptor who teaches the highest path. What responsibility and duty have I than conferring joy on him, who is both father and teacher? This is my dearest duty, my Dharma. I will derive immense Ananda in the forest for fourteen years. Not merely fourteen, if fatherís wish is such. I am prepared to live all my life in the forest itself! But, why is it that father is hesitating to tell me about these two boons? This is what pains me. Will I ever say no to what he says? Rama is the servant and support of the parental word, not its opponent. Is there any act of gratitude nobler than dedicating this body, which was received from the father, to his service alone? I shall offer it with Ananda; I am not one who waits to be told to do so. "Mother why did you not mention to me that Bharatha is the person to be crowned? I and my brother - there is no difference between us; why then did you entertain any difference between us? We know no distinction among ourselves. Also, why is it that you say, ëThis is your fatherís commandí? Do I ever disobey your commands? No I never do so. Whether you say it or my father says it I un-hesitatingly carry it out. I am leaving Ayodhya this very day, and proceeding to the forest. Mother! Send proper messengers charged with the task of bringing Bharatha from the grandfather's place. It is best to get him quickly. If my moving into the forest and the coronation of Bharatha happen at the same time, father will be saved from physical strain, mental anxiety and the sense of void. And you too can be fully content! Who can say how events will shape themselves?" When Kaikeyi heard these words from Rama, she was filled with Ananda and apprehension. She feared what might happen if Bharatha arrived while Rama was still present in the city; she concluded that it was best to insist on Rama leaving for the forest that very day itself. She replied, "Rama! It is possible to make arrangements to get Bharatha from where he is to Ayodhya; but, there is no need why you should continue here until he reaches this City. Since you have decided to start the hermit life, why should you delay your departure? For, the longer the start is delayed, the day of your return too will be advanced! It is advisable that you get ready to leave even now. "Your father is eager to tell you this himself, but, he is unwilling to express his command directly. Though his heart insists that he should say it, he is bothered by a sense of shame, for he loves you much. He is reluctant to inform you of his promise to me; that is the reason for his distress. He has no other grief. The quicker you depart from Ayodhya, the sooner he will recover from agony. Until you leave Ayodhya, I am afraid, he will not take food or bathe. Therefore, if you yearn to restore him to happiness, the sooner you depart the better". Dasaratha lying prostrate on the bed heard these heart-piercing words of Kaikeyi; he could not contain his anger and sorrow. He burst into indistinct fury, "Fie on you, traitorous demon!" 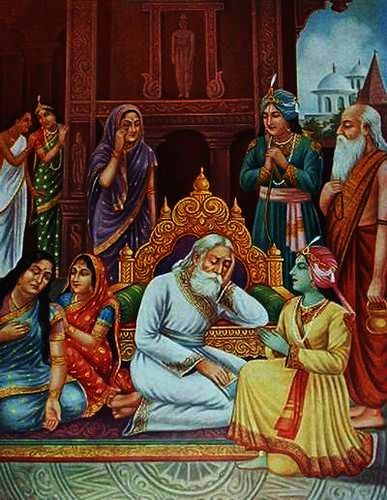 and turning to Rama, he cried, "Rama" twice, before he fainted again. Rama sat on the bed, with the head of his father on his lap; he stroked the forehead and consoled and comforted him with sweet lovingness. He also spoke to Kaikeyi, "Mother! I am not a covetous fellow, poisoned by worldly ambition. I have no desire to win over the people and establish my rule over the kingdom. I wish to live like a hermit; I yearn to foster and maintain righteousness (Dharma), that is all. I have only one more resolve: to confer joy on my most revered father. To realize these three objectives, I am prepared to undertake any task. A son has no greater duty, no higher good, than serving the father. Mother! Though father has not directly spoken to me, you are telling me what his command is, arenít you? That is quite enough. Besides, you are speaking in his very presence, and despite his hearing what you say, he is unable to alter or deny anything. Therefore, I infer that your words are virtually his. So, I bow to the order, and shall leave as directed. "Mother! I have one little wish, which I hope you will fulfill. When Bharatha is ruling the empire, see that he obeys in every way the orders of Father and that he contributes to the joy and satisfaction of Father by his acts. For me, for Bharatha; indeed, for every son, there is nothing more holy and more fruitful than the vow of filling the heart of the father with contentment and happiness. Service of the father is the Sanathana Dharma, the eternal duty, of the son". With these words, Rama fell prostrate on the ground and touched the feet of Mother Kaikeyi. Dasaratha, who heard his Son, writhed as if the Dharma that Rama expounded and the equanimity which he revealed aroused his love even more and thus aggravated his sorrow beyond control. Knowing that Rama will not stay in Ayodhya any longer, he lost all sense of propriety and status. He shouted, "Rama! ", and slumped on the hard floor of the room. Women in the zenana heard the thump, and were stunned into grief and wonder. They lamented loudly among themselves at the turn of events. Rama realized that it was not advisable to delay any longer. He prostrated before his father and touched his feet. Then, he walked out of the apartment. Lakshmana was standing at the door and listening to the words spoken inside the room. He was in tears; he was furious against Kaikeyi and angry against father. He found it impossible to give expression to his feelings; so, he followed the footsteps of Rama with arms folded, eyes on the ground, head bent low. Though he had lost a kingdom, and had to exile himself into the forest, Ramaís face shone like the moon behind thick dark clouds, unaffected by the black veil. The splendour of his countenance was unaffected; for, he faced honour and dishonour with equal serenity. He behaved like a veteran Yogi, with no trace of agitation in thought, word and deed; he walked as if nothing had happened to cause him worry. However, Sumanthra guessed that some transformation had happened inside the palace. The guess soon grew into certainty. When his eyes fell on Lakshmana, his heart suffered a shock. To add to his fears, Rama brushed aside the White Umbrella that was held over him by the attendant. He ordered that the ceremonial whisks be not used for him. He declared that he did not deserve any more the silver chariot. On hearing this, Sumanthra lost strength of body and will. He was confirmed in his worst fears. Rama did not speak a word to those around him or to the citizens he met; not that he was sad, no, he knew that others would be hurt if they heard the news. For, if he spoke, he would have to speak out the truth; and he would be spreading sadness through his own words. In spite of this, his style of walking back to the palace announced the sad news to all onlookers. Rama did not proceed direct to the apartments of Sita. He chose to walk to the palace of Kausalya. The palace was resplendent with flags and festoons and other external marks of jubilation. The women and other attendants of the palace got intimation of the approach of Rama and Lakshmana to the mansion and they got ready lamps on plates, and ranged themselves in rows to welcome them. Old and trusted guards at the main entrance rose sharply when they espied the Brothers, and exclaimed, "Victory! Victory" "May it be victory to you"! They bowed low and offered homage. When Rama entered the second square inside, Brahmins who had gathered there showered their blessings on him. On entering the third square, the young maids in attendance on the queen rushed in, carrying the happy tidings that Rama and his younger brother were arriving, to offer reverence to the mother. They were themselves delighted at the sight of the princes. From the outer door right up to the room where the Mother was, maidens standing on both sides of the long passage waved ceremonial lamps as sign of welcome, to ward off evil and welcome joy and prosperity. Queen Kausalya had observed vigil all night, in preparation for the holy day that had dawned. She was engaged since dawn in worshipful rites. Aged Brahmin priests were propitiating the God of Fire with Vedic hymns, when Rama was announced. The mother was overwhelmed with joy, since she could witness with her own eyes the Coronation of her son. She celebrated her joy by means of several rites; she gave away plentiful gifts. She fasted and kept vigil; Ananda was enough food for her, the Ananda she shared with all. She ran forward to clasp Rama in her arms; she caressed the curls on his head; she led him by the hand into the shrine room where she was spending the morning. She had no knowledge of the somersault events had taken. Innocent and simple-hearted that she was, she wore the white sari of purity and with the sacred silk cord tied round her wrist, she was gratefully engaged in the worship of the Gods. Looking at the face of Rama, she noticed an added splendour illumining it. So she could not contain within herself her Ananda. "Son!" she said, "your forefathers were all Royal Sages, Rajarshis. They were strong upholders of Right. They were super-souls, Mahatmas, each one. You shall be as long-lived as they, as renowned as they; your glory must reach the ends of all the quarters as their glory did. Son! Follow the ideals of Righteousness which were held high by this dynasty; do not neglect them, even in a fit of absence of mind. Hold on to them, without wavering in the least." With these words, she placed a few grains of rice on his head, in token of her blessing on the auspicious day. She placed a golden seat near hers, saying, "Son! You observed the ceremonial vigil last night, didnít you? And, you fasted yesterday, according to rule. You must be exhausted. Sit here for a while, and eat a few fruits." So saying, she held forth a gold plate of fruits which she had made ready for him. Rama was thrilled by the Ananda of the mother and the love she showered on him. He wondered how he could communicate to her the turn of events; he was unwilling to destroy the atmosphere of joy. For the sake of giving her satisfaction, he sat on the golden chair, fingered the contents of the plate and said, "Mother! From this moment, I should not touch gold. I should not sit on golden chairs. I am awaiting your blessing, for, I have to proceed as an exile to the Dandaka Forest. I came to you for taking leave". Kausalya could not understand a word of what he said. She could only say, "Son! Within a few minutes, you are to be crowned King, and you talk of the Dandaka Forest! I am at a loss to make out the sense of what you say". She thought her son was teasing her with a joke. She said, "Son! In this auspicious hour, you should not, even in fun, talk of things of bad omen. Give it up, my lovely gem!" She scooped with her fingers a little from a plate of rice, boiled in milk and with sugar, and placed it on Rama's tongue! Observing her love and her Ananda, the eyes of Lakshmana were spontaneously filled with tears. Kausalya noted it; she turned to him, and inquired, "Lakshmana! Why are you so sad?" She hurried towards him and tried to caress him, but Lakshmana could not suppress his grief any longer. He wept aloud and sobbed. The queen stood aghast; she did not know why he sobbed. Ramaís words and Lakshmana's grief confused her much. Meanwhile Rama interceded: "Mother! if you promise not to grieve, I shall tell you one thing" and he held her hands in his, very firmly. "This is something that will endow me and you, and our entire family and dynasty with imperishable glory. So, donít give room for any anxiety, doubt or distress. Agree to it with alacrity and affection. Does it not give you great joy that I obey fatherís command? He has resolved to crown my brother, Bharatha! He has resolved to send me, in the habiliments of a hermit, into the Dandaka forest for a period of fourteen years. I have bowed to his command and come here to take leave of you." At this, Kausalya shrieked "Rama", and fell on the floor. "What a turn of events is this? Is the tender child of mine to be sent into the dark jungle? What crime has my Rama done to deserve this? Can this be true? Or, is it meaningless jabber coming out of my own brain, since I had no sleep and no food?" While she was thus trying to explain to herself and consoling herself, the happenings at Kaikeyi's palace had spread throughout the zenana and the noise of wailing and lamentation rose from maids and attendants everywhere. All faces streamed with tears in great sorrow. Cries of "Rama! Do not leave us", were heard on all sides. Grief-stricken groups hurried to the palace of Kausalya, who was overwhelmed with astonishment, sorrow and fear. She could not unravel the mystery of it all. She could not rise from the floor, for she was weighed down with anxiety and despair. Nevertheless, she was longing to understand what had really happened to cause this universal agony. She drew Rama on to her lap, and caressing his curly hair she asked, "Son! What is this I hear? This news? Tell me clearly what took place. I cannot bear this suspense any longer". Rama told her, "Honouring the two boons that father had promised Kaikeyi once upon a time, father granted her these two wishes". Rama told Kausalya that the first boon she was granted was, "Bharatha is to be crowned" and the second was, I should be sent to the Forest for fourteen years". When Rama related these facts and confirmed their truth, Kausalya exclaimed, "Rama! Did Kaikeyi really demand such boons? Kaikeyi had unbounded love and affection towards you. She would not have wished for these things any day. Let that rest. Even if she has, I am sure it must be only to test the king! For this simple thing, why should there be so much confusion and anxiety? Or, assuming that she asked for the boons; will your father ever agree to grant them? I refuse to believe this. Will your father, who cannot tolerate your absence from his presence for a single moment, send you away into the forest for fourteen years? This is plunging me into more confusion." Seeing his mother doubting the truth of the incidents that actually took place, Rama again held both her hands in his and pleaded, "Mother! Believe my words! Father had already promised to grant her whichever two boons she desired; afterwards, when she asked for these two, he had no inclination to break his plighted word, to take back the promise he had solemnly granted. Nor could his mind agree to order me into the forest and be without me. So, he is suffering great mental distress. I cannot bear the sight of his affliction. I have just now returned from that palace. He is stricken unconscious: he is in terrible anguish. This is the truth. I am not so cruel as to cause such anxiety in you over a light laughable matter, believe me. I have accepted fatherís order; I have come to you for your permission." With these words, Rama fell at the feet of his mother. Kausalya lifted him up tenderly. She said, "Rama! What strange behaviour is this? However barbarian a person may be, will he demand these horrible boons? Can ever any human being think of sending you, who is to be crowned in a few minutes, into the forest and for fourteen years? Am I to suffer throughout my life? I got a son, after observing many a vow and ritual. Looking on your lovely face, I overcame the pangs of those years of sorrow. I have no other desire; I ask for no other boon; enough for me if my son is with me, near me. Have I become unfit for this little gift? Did I deliver a child only to throw it into the forest? Will any mother agree to send her son into the jungle? Alas, what sin have I committed in the past? In which of my previous lives have I kept apart a mother from her son? Since the day when you were initiated into Vedic studies, I was deriving happiness every moment from the thought that the day of your Coronation was drawing near. Have those sweet dreams of mine come to naught? Have all my hopes been dashed to the ground and broken to pieces? Have all the vows, vigils, rites and rituals I so scrupulously observed and performed for ensuring your joy and happiness been in vain? 0! what a big sinner am I? Why has my heart not broken on hearing this news? Perhaps, I have to hear and bear many more heart-breaking news! Death does not help me! My heart still beats, in spite of this shock. Alas, even death awaits the allotted moment. He comes; but on seeing my plight leaves me alive, postponing the moment of my release. Yama too has no mercy towards me, I am pronounced undeserving of even the realm of Death. O Rama! That this calamity should happen to us!" She lamented and fell on the floor in a faint. Coming to, she rolled on the floor, pressing her heart with the palm of her hand. Rama could not quietly look on the scene. The wailing of the maids, who gathered around blasted his ears like thunderbolts.